ULV Fogger Stand for ultra low volume foggers.. The designation refers to treating in small or covered areas with relatively small amount of chemical or formulations in an aerosol state.. The Range size of micron particles or droplet created in aerosol fog are measured between 5 to 50 micron( adjustable as per requirement). Best Use For Hospital or School or Clinic Use. Best Sprayer Cold/Ulv Fogging Machine is a premium quality Sprayers from Best Sprayers. Moglix is a well-known ecommerce platform for qualitative range of Sprayers. All Best Sprayer Cold/Ulv Fogging Machine are manufactured by using quality assured material and advanced techniques, which make them up to the standard in this highly challenging field. The materials utilized to manufacture Best Sprayer Cold/Ulv Fogging Machine, are sourced from the most reliable and official Sprayers vendors, chosen after performing detailed market surveys. 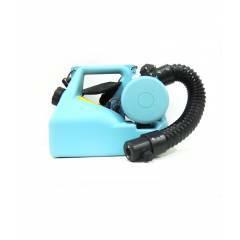 Thus, Best Sprayers products are widely acknowledged in the market for their high quality. We are dedicatedly involved in providing an excellent quality array of Best Sprayers Sprayers.